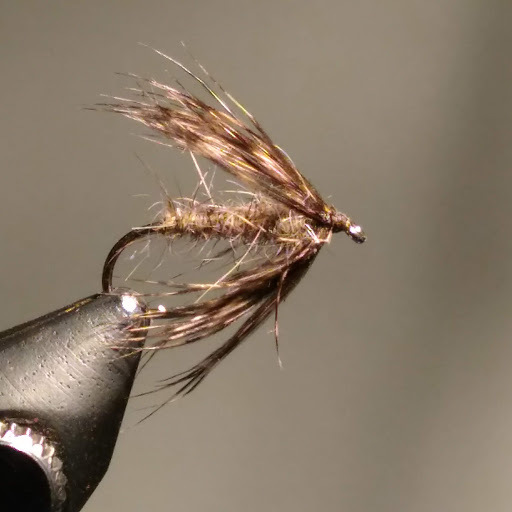 This month’s fly is the soft hackle Hare’s Ear nymph. This is one of my favorite flies. During the summer, I use it in smaller sizes for tan Caddis hatches. It can be fished deep or swung in the surface film. In the fall, it is good in larger sizes as a wet fly in combo with other wet flies like Partridge and Orange, or Red Fox Squirrel nymph. It can also have a bead on the head to sink it a little. Sometimes I put a red thread band on the head.